Hot, gooey, creamy, cheesy...I have your attention, right? January diet? Um...calories don't count while watching football. Or award shows. Or Netflix. Feeling better about this? Good. Let's get back to gooey cheesiness. 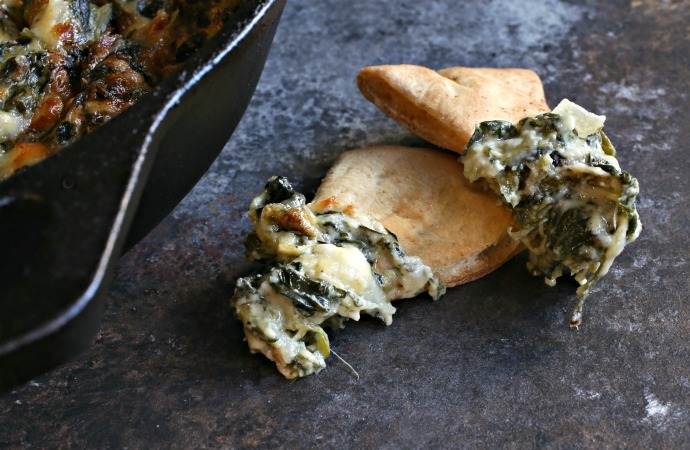 This recipe is my mad scientist hybrid between spinach artichoke dip and creamed spinach. And since both are delicious, I figured this couldn't go wrong. 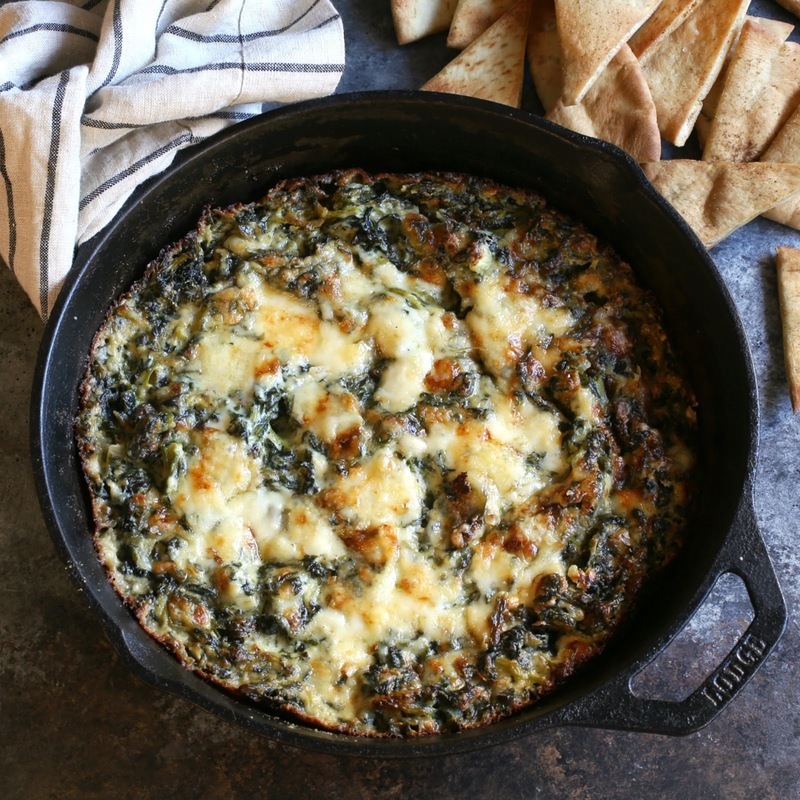 I was originally going to make the spinach artichoke dip without the artichokes for those people who might not exactly, totally love artichokes. Ahem. But as great as the cream cheese and mayo combo is, I felt like I wanted a more melty cheese. So I started thinking about my favorite sauce cheeses like Gruyere, smoked Gouda and Fontina and that led me to make a bechamel base instead of the mayonnaise. 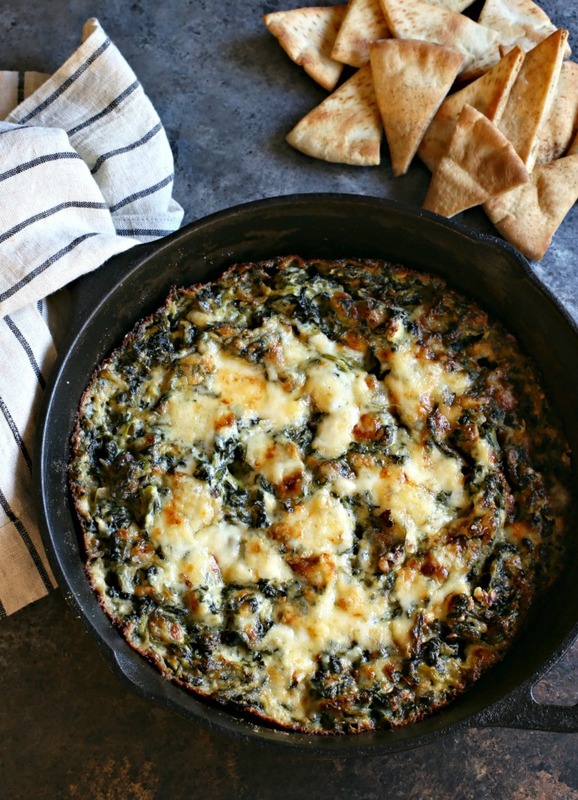 Sauteed onions and garlic make things taste good, cheese makes them taste better and before I knew it, I had this glorious baked spinach dip. I made some homemade pita chips but store bought is fine. Then I invited people over to share because the chances of my eating this whole thing by myself were way too high. Enjoy! 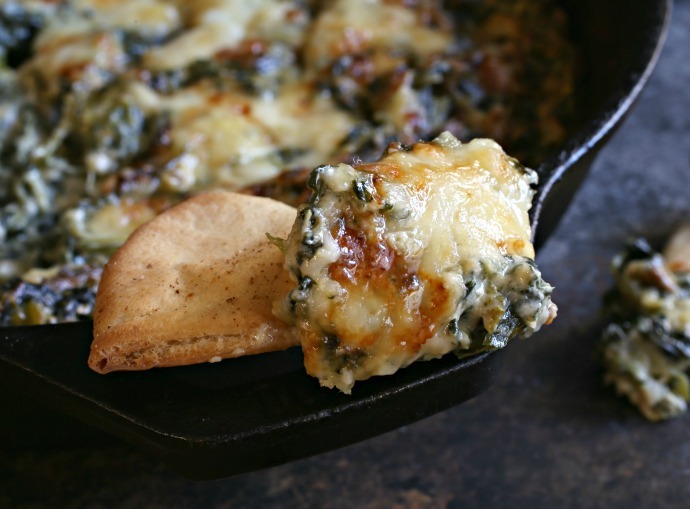 Recipe for a hot baked spinach dip with 3 cheeses. Cut the pitas in half, then half again until you have 4 large triangles. Then cut each triangle in half. Place on a baking sheet lined with parchment paper and brush with olive oil. Sprinkle with sea salt and bake for 10 minutes. Remove from the oven but leave it on. While the pita chips are baking, add 1 tablespoon of butter and the diced onions to a skillet or cast iron pan. Saute for 10 to 15 minutes until the onions are softened and beginning to caramelize. Add the minced garlic and continue cooking for another minute. Add the remaining tablespoon of butter and, after it melts, sprinkle on the flour. Continue cooking and stirring for another minute. Slowly begin whisking in the milk and cream. Add the Parmesan, smoked Gouda or Gruyere and half the Fontina cheeses. Season with the salt, pepper, nutmeg and red pepper flakes, if using. Continue stirring until all the cheese has melted and then stir in the spinach until well incorporated. Top with the remaining Fontina cheese and bake in the oven for about 20 minutes or until the cheese is lightly golden brown. Serve warm with the pita chips.